Last week one of our girls named Mary heard about a little baby who’s mother had died. In Poipet, most of the population actually work in Thailand, so there was no one to care for this little baby. She was only three months old and was covered with little bed sores, insect bites and dirt was caked in her hair and skin crevices. Mary told Noit about the baby and with tears asked if Noit would be willing to care for the baby. Noit explained that babies are best with their family and relatives, not at a large home. Mary was incessant that no one was caring for the baby and the baby might die. With tears Mary, who is 15, said that if Noit would agree to care for the baby now, Mary would adopt her when she is older. Finally, after many of Mary’s tears Noit agreed to look into the situation. Mary didn’t wait. She left after dinner and came back in the night walking down the muddy road carrying a dirty little three month old baby girl. Immediately, everyone at the home went into action going to buy formula, donating their clothes, blankets and bathing the cute little baby girl. The next day the leaders and Noit went to talk to the authorities to make a report, and to find out the real situation of this abandoned girl. The baby’s Aunt, only about 20 years old herself, came to the home and pleaded with us to care for the girl. She explained that many people wanted to adopt the baby girl, but they knew that they would never see her again if she was adopted, and that people often treat adopted children very badly in Cambodia too. So they were glad to give her a home with us, so they could come and visit and be involved in her life. As they were talking the lady notice one of the boys playing. She asked, “Bamboo Bush” lives here? Noit asked who was “Bamboo Bush” and the aunt pointed to Pek. She explained. I know his mother. We worked in the same farm in Thailand. The mother was so poor that Pek was actually born while she was working in the field, under a bamboo bush. So we always called him “Bamboo Bush”. He was always skinny and we were surprised he lived. Where is his mother now? This is the first information we have ever learned about Pek, so we were eager for more information. Pek was brought to the home speaking no Khmer, only Thai. His mother died at a local hospital and her two kids did not know where they were from, nor any of their relatives, so the government set them to us. Pek, is Mary’s little brother. The story had come full circle now. Pek and Mary were left abandoned when their mother died. They have received love, care and education for the last three years and naturally want to share that love with others. It so happened, that their love was shown toward a little baby who not only shared a similar life story, but who actually had shared some of Mary and Pek’s history too. 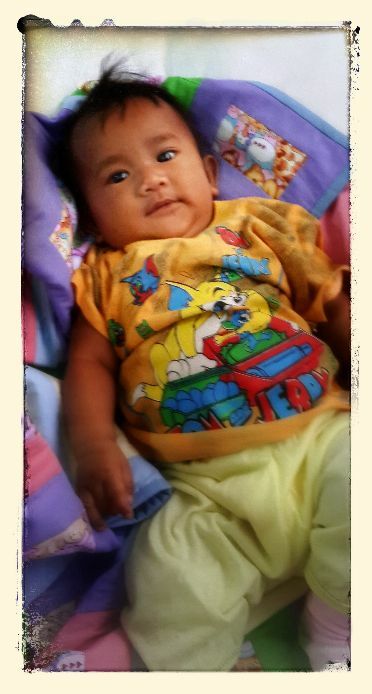 The baby had not been named so Noit ask the aunt, “We would like to name her “Pearl” because she is a precious pearl in God’s sight” (Srey Kouit in Khmer). The aunt agreed. So, her name is Pearl. A precious pearl indeed. God has a special plan for Pearl. It is exciting that God is using you and your ministry to enable Pearl to journey the path God has for her, and to fulfill the calling God must have on her life.